CLEMSON, South Carolina — As the rate of Lyme disease grows rapidly across the United States, new research offers veterinarians a forecasting map that tells them which parts of the country are most at risk of Lyme disease infections in dogs, which could also help track and predict Lyme disease in people. The forecast map, created by Christopher McMahan, an assistant professor of mathematical sciences at Clemson University, and Michael Yabsley, a parasitologist at the University of Georgia, shows the predicted Lyme disease prevalence — the percentage of dogs who are likely to test positive — in each of the 48 contiguous states. It draws on monthly test data from veterinarians, providing the most timely picture of Lyme disease cases available. “Our research into modeling disease in space and time shows us how dynamic canine Lyme disease is on an annual basis. It’s our hope that these maps can be used to optimize patient care by veterinarians and public health officials or physicians,” McMahan said. Ticks that carry the disease-causing bacterium, Borrelia burgdorferi, were once thought to be limited to northern parts of the United States, but recent research shows they are now in half of the counties across the country, including Southern states. Yabsley and McMahan combined factors associated with Lyme disease — forestation, surface water area, temperature, population density and median household income — with nearly 12 million B. burgdorferi antibody test results collected between 2011 and 2015 in dogs, by county, in the contiguous United States, provided by the veterinary diagnostic company IDEXX Laboratories Inc. The research is “a call to action for people to protect their dogs and for veterinarians to engage in conversations with their clients about risks to their pets and options for prevention, including vaccination and tick preventatives,” said I. Craig Prior, a veterinarian at the VCA Murphy Road Animal Hospital in Nashville, Tennessee, and president of the Companion Animal Parasite Council (CAPC) board of directors. Ticks feed throughout the year, Prior said. As mice and other animals that ticks feed on move into new habitats, the ticks, and Lyme disease, move with them. The research also has implications for Lyme disease in people. “Dogs really are the canary in the coal mine for human infection. Our research team has growing evidence that the relationship between risk of canine infection and human disease is strong,” Yabsley said. “Because dogs are being tested for exposure during annual exams, these data are available on a national scale, something that is difficult to achieve when studying the ticks and environment directly,” Yabsley said. McMahan and Yabsley are expanding this analysis and plan to release additional data on the relationship between human and canine disease later this year. The research was originally conceptualized by the CAPC, which assembled a team of scientists from a variety of disciplines and institutions to address a major gap in the understanding of parasitic disease prevalence. CAPC is a nonprofit that works closely with academia and the animal health industry to provide veterinarians with up-to-date information on parasitic infections in pets. 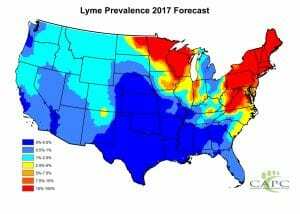 Veterinarians have typically relied on a preconceived understanding that Lyme disease was endemic in the Northeast and central United States. Initial symptoms of Lyme disease, which appear between five and 30 days in humans and two to five months in dogs, are flu-like: fatigue, low fever, achy muscles and joints. But if left undiagnosed or untreated, Lyme disease can cause long-term complications of the heart, nervous system and muscles. Next Post » Has your Congressional representative joined the Lyme Caucus? Let your doctors know it’s here!!! Are caninie gettind better than humans, seems apparrentely they are. Wished I was A dog. How profound A ststment may seem It’s obviouly true hum. lay here and die because if I was A dog , someone would say something got to be done about that dog he looks sick , and they would take him to the vet and they actualy help him get better. Oh how I wished I was A dog, how profound. Yes, lyme vaccine available for the pets but not humans. There is much money to be made in medical testing, treatments, meds, hospital, doctors, staff upon staff…..whereas a dog might be put down out of its misery. It is all to save the insurance cos from having to pay out! Hi Chris, remember our discussion about Sonoma County? I see the number of reported cases are less than 10% of what they were before you discovered that one chain was reporting 4 non-contiguous counties as our county’s data. Then the next year, all the numbers dropped drastically, so did you just omit that chain rather than try to correct the problem? Recommend you discuss that with your vet. I recently got a young dog but had to tell the breeder it is unfair to bring a healthy young dog to a 01068 awful place! Have movies of my dogs enjoying the yard and now we are trapped inside and pay 6000$ in taxes and lost medicaid Mass health because of politics and lies! I prefer most dogs to most people but they do get treated! We get shafted to protect the insurance cos ! Jane in MA Lyme since 2004 almost died in 2005 from a GI bleed and I do not get Mass health because of the awful corruption in MA! I have now survived two cases of Lyme disease. Was misdiag osed by my primary doctor for 5 months. An immunologist cured me in two months of Doxicycline. First question be asked, “Have you changed your primary doctor yet?” I did. I am grateful he cured me, I could barely walk. 7 months later, I got bitten again at our lake cabin while on a deck. Brought the nymph to him again. Yes, under the microscope, it was. He treatex me again. It failed. Took 2.5 years to treat with a specialist. I am cured again. Got an apology from the immunologist. He will treat everyone with suspected Lyme. New research reveals that Lyme leads to MS and ALS and people must stay o antibiotics to survive.I am Please search for better doctors, praying for you. I now email President Trump and call the comment line about the situation! Glad the blood supply will now be tested! Had friend from Russia whose borzoi aka Russian Wold hounds died from Babesiosis ! So sorry to hear about the dogs. My biggest hope is that more doctors will treat people with the new program. To get educated. To give people simple antibiotics to have them next to normal is merciful. Better than being incapacitated and in severe pain. Isn’t what doctors there to do? I find them seriously uneducated about treatment. Also, more preventative media announcements on tv, radio, facebook, etc. Hope it happens. Thank You about the dogs ! It was so very sad! They were Russian Wolf Hounds aka Borzoi and only a year old! Beautiful dogs! Thanks again!